travelersthreeinsearchofamerica – Page 5 – Three Souls Adventuring! We are now committed! We’ve told too many people and our house is rented. If it were only that simple. For now, many issues have arisen that we had not considered. Not “deal breakers”, but affecting decisions that must be addressed. One problem; towing our car. In the beginning, we thought that towing our car (behind our Class A motorhome) was a “no-brainer”. Certainly we wanted the option of convenient, affordable transportation once we settled for a couple weeks in one location. But towing is more complicated than we had thought! Our motor home is an older model; perhaps the added weight would place undo stress on the engine. Gas mileage is already low at 8 mpg and towing a heavy car would reduce that even more. We also found that most cars cannot be pulled along flat; an expensive tow-dolly or trailer must be purchased. Added expense and we are on a budget. Ultimately, we decided to drive both vehicles separately; at least to Florida, where we will stay & promote our business for three months. We need to learn to live in this fiberglass box and create some good habits. Being without a car will be impossible and long-term renting appears too expensive. That said, after we move westward, we plan to store our car and short-term rent cars when needed. Our friend, Susan Keith at VIP Travel in Rochester, NY will be helpful and I recommend her to you, without reservation (pun intended)! She has made our other travels convenient and we always save money! Please comment and stay with us, along the way. Photos & videos will be forthcoming. We will be “on the road” December 26!!! We had a plan; two years, become debt free working our Melaleuca business, then buy a recreational vehicle, and travel the country in search of America. Simple plan, very doable; but sometimes well-thought plans are affected by the desire to live with no regrets. 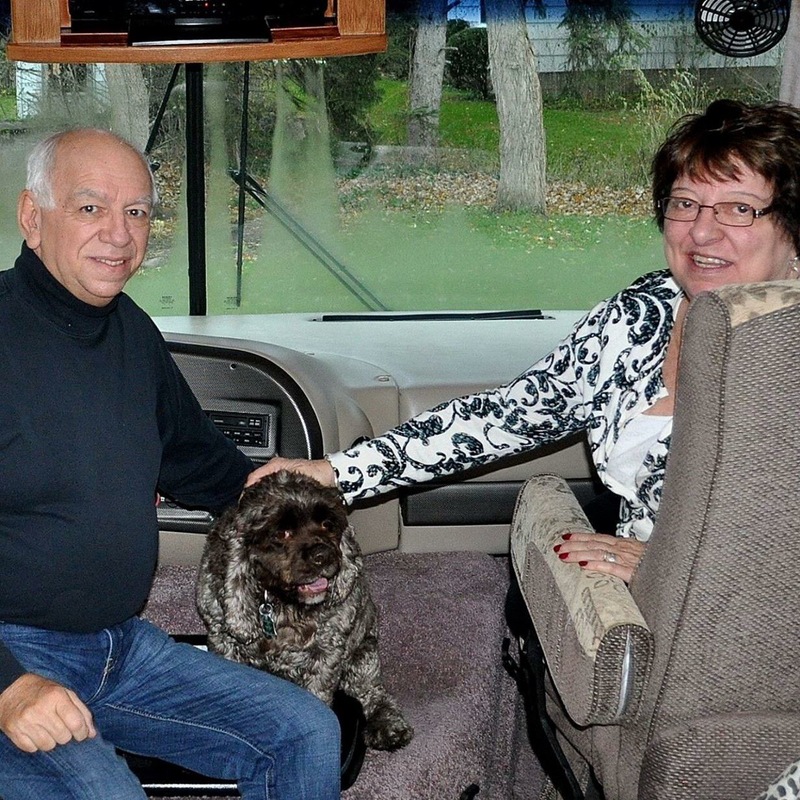 Let me introduce ourselves; Sharon and Dave Lewis and our trusty dog, Maximus! I guess you describe us as semi-retired, debt-burdened (no different than most our age), quietly adventurous, people who wish not to reach our life end having too many experiences not enjoyed. Sharon is a former college administrator now doing consulting & field research. Dave is a former counselor & college professor turned entrepreneur. Maximus is a dog! Long story short; we happened upon a “previously enjoyed”, 31 ft. motor home (13 years old, low mileage) Four Winds Hurricane! It called to us and all of a sudden, it’s ours! Well, we can’t just let it sit there! So we began thinking of the foolish adventure that we can’t afford, is completely irresponsible, is not reasonable, and that we just have to do! Our “why nots” supersede the better play safes. So here is the adventure and we invite you to follow along (sometimes Dave will write, sometimes Sharon), there will be video and there will be photos. If you are near where we are; come for a visit or travel along. Know that we continue to work and that we will be doing this on a budget! The beauty of our business is that we can work wherever! More about that later!!! We have rented our home for a year. Toward the end of December, we will head south and spend a couple months in a warmer climate and adapt to life in a rectanglar box. After that, we reevaluate and hopefully head westward. Along the way, we hope to discover America; the one we are confident remains, tolerant, loving, hopeful. Author travelersthreeinsearchofamericaPosted on November 10, 2016 November 10, 2016 Tags adventure, Life in an rv, lifestyle, living on a budget, melaleuca, retirement, travel2 Comments on THE THREE OF US!